Fumacell represents a unique combination of herbs know for their strong anti-inflammatory (Boswella, Phellodendri) immuno-regulatory (Sarcandrae, Morinda), anti-spasmolytic (Peony) and strong detoxifying (Smilax) properties and a natural cellular energy supporter L-Carnitine fumarate. Suggested Usage: As a dietary supplement, take 4 capsules each time, two times a day, or as suggested by a healthcare provider. Sensitive individuals may want to take with food. Current conventional treatments for chronic autoimmune and inflammatory diseases remain symptomatic, relying mainly on pain relievers (Vioxx, Celebrex, Tylenol ect...) and immuno-suppressive drugs (Methotrexate or Corticosteriods) or surgeries such as a splenectomy. The selected herbs and a natural energy supporter in Fumacell were chosen specifically to support and restore healthy body immune system balance*. 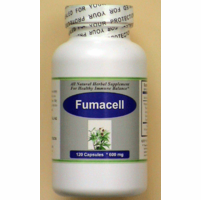 In contrast to the immuno-suppressive approach that uses a drug to suppress the entire immune system including healthy immune cells, the herbs in Fumacell are known to be strong immuno-modulators. Although a detail picture of how these herbs will positively affect the immune system is not known, immuno-modulatory properties of these herbs are thought to enhance the healthy immune cells and suppress the abnormal immune cells that attack the bodies own tissues.